This rich beef braise makes a good family dinner. Serve it with pasta or rice on the side. Preheat oven to 325°F. Prepare a casserole. Heat oil in a skillet over medium-high heat. Pat beef dry and season with salt and pepper. Add beef to skillet in batches and sear until browned for about 1 minute per side. 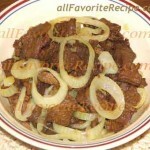 Transfer beef to a casserole. Reduce heat to medium-low. Add pancetta and cook until golden for about 2 minutes. Add onions and carrots and cook for 2 minutes, or until softened. Add garlic and cook for 1 more minute. Add wine and rosemary and bring to a boil, scraping up any caramelized bits on bottom of pan. Add stock, tomatoes and bay leaf. Bring to a boil. Bake, covered, for about 2 hours or until meat is tender. Cool. Skim off any fat and remove bay leaf. PANCETTA is unsmoked Italian bacon that is cured with salt and spices. It is made from the pork belly and afte curing is rolled into a salami-like roll. You could use bacon instead, but there is no real substitute. 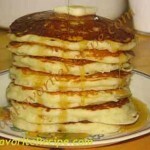 Have You Tried These Other Free Recipe?